No matter the size of your space navy, do not mess with Lady Harrington, her crew, her star nation, her family and especially her 'cat. The 'cat will cut you. Honor Harrington is a Military Science-Fiction series by David Weber. The book series is mainly set around the adventures of the titular heroine, although we see a fair amount of the wider universe. The primary conflict of the storyline is the Star Kingdom of Manticore (The Good Guys) vs. The People's Republic of Haven (The Bad Guys Who Aren't Entirely Unsympathetic). Weber has explicitly described the series as "Horatio Hornblower" IN SPACE! with the series being a great deal more focused on (Space) Naval operations than other science fiction series. 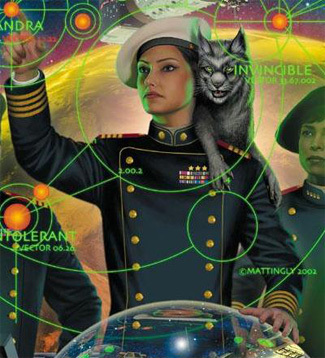 Honor Harrington occasionally performs ground-based and political adventures, but the vast majority of the series is focused on her ship-to-ship conflicts, where she serves as commanding officer. However, like almost all Long Runners, the story's scope has expanded a fair bit, with an increase in moments when Honor isn't "on-screen," and other prominent supporting characters have taken center stage at various points. The series is notable for the low level of Artistic License  Physics, and thus the above-mentioned space battles are entirely unlike anything seen on Earth. For example, once a ship builds up some velocity, it keeps going unless it boosts in the opposite direction, which takes longer the greater the velocity is. This has major implications in combat. Several spinoff series have been published, two to expand on current events within the series, and two looking at the early years of the Star Kingdom of Manticore; all but twonote the Saganami Island series, set in the Talbott Quadrant, which has four books, and Manticore Ascendant set in pre-wormhole days are trilogies. In the first set are Saganami Island and Wages of Sin. In the second is the Stephanie Harrington Young Adult series, centered on one of Honor's ancestors, and Manticore Ascendant, written by Weber and Timothy Zahn, with assistance from Tom Pope of BuNine. There are also several anthologies, universe information books, and games and other media based on the series. The main-line novel series, primarily following the adventures of the titular character and events on and around Manticore, as well as those in the (People's) Republic of Haven and the Protectorate of Grayson. Among others. On Basilisk Station: When the prototype weapon mounted on Honor's light cruiser HMS Fearless fails to work as well as its designer wished, she and the crew are sent off to the eponymous backwater, where Honor's old enemy Pavel Young is in command, the natives are troublesome, and Haven is behaving suspiciously. The Honor of the Queen: Manticore sends a diplomatic and military delegation to the Protectorate of Grayson, hoping to form an alliance. But the other side's sexism makes things difficult, and Haven is working through Grayson's longtime enemies, Masada, against them. The Short Victorious War: Haven attempts to thrust further into Manticoran territory, but are only so successful — and the nature of the Havenite regime itself undergoes a sudden change. Field of Dishonor: Disgraced by his poor conduct during the previous novel, Pavel Young plans and executes a vicious revenge against Honor — but not without consequences. Flag in Exile: Honor returns to Grayson to manage her steading, where enemies conspire against her, and Honor finds that even out of space she has more than one battle to fight. Meanwhile, the war against Haven intensifies and Manticore starts to lose momentum. Honor Among Enemies: Honor is called back from Grayson to command an anti-piracy mission of Q-ships in the Silesian Confederacy, a lawless but important trading market, and finds a few unlikely allies. Meanwhile, Havenite officers frustrated with the current regime try to force a change. In Enemy Hands: Honor is captured by Haven and is taken to be executed for bogus charges dating from On Basilisk Station, but the voyage will have severe results for the People's Republic. Echoes of Honor: The emboldened Havenite navy launches devastating deep raids against Manticore as its internal politics continue to shift. Meanwhile, Manticore and Grayson continue to grieve over Honor's execution, but the video of her death is a fake and Honor is actually plotting her escape from a prison planet called Hades — with the help of a few unlikely allies. Ashes of Victory: Honor recovers from her long stay on Hades while teaching at Saganami Island. The war between Manticore and Haven heats up even more, with major events on both sides that completely change the politics of the conflict. And Thomas Theisman, with the help of a few fellow patriots, finally makes a stand for the Republic he loves. War of Honor: A cease-fire has held between Manticore and Haven for several years. Honor, out of favor with the current Manticoran government, has lost her command, but she's vocally opposed to reduced military spending and considers the new government to be fools. To quiet her, the government gives her a command at a remote outpost near Silesia, but where "The Salamander" is, fires will burn. Meanwhile, the new Havenite government struggles to keep the peace against popular pressure and dangerous political rivals. At All Costs: Manticore struggles to overcome the loss of so much of their navy due to cutbacks and attrition in War of Honor, so Honor commands a fleet equipped with cutting edge technology to make quick strikes deep into Haven territory. Haven sees Manticore's weakness but is terrified by the implications of the new technology, and what they do next causes the war to come to a climax. Mission of Honor: Honor leads a diplomatic mission to the heart of Haven in order to finally create true peace, but the Solarian League threatens the negotiations by drawing Manticore into a second conflict and tipping the balance of power. Haven's President Eloise Pritchart takes the risk of her life to clear the air once and for all, and may be the answer to Manticore's prayers... but the mysterious planet of Mesa has dangerous plans of its own that bring disaster to the Manticore system. A Rising Thunder: The Grand Alliance has formed and begins to knit together as wounds old and new start to heal. But the cracks in the Solarian League are beginning to show, and the young alliance now faces an escalating conflict with the Solarian League Navy. Uncompromising Honor: As the bureaucrats running the Solarian League launch a series of increasingly brutal attacks, Honor leads the Grand Alliance fleet straight to the heart of the League—old Earth itself. The Torch sub-series, following events on and around the planets of Torch and Mesa, and the adventures of Victor Cachat and Anton Zilwicki. Crown of Slaves: Anton Zilwicki leads a small group to the Republic of Erewhon to try and convince it to stay under the Manticoran umbrella. The problem is, Havenite superspy Victor Cachat is there to convince the locals to his side, a group of Solarians are up to no good, and other factions have their own plans.note This novel runs concurrently with War of Honor. Torch of Freedom: Anton Zilwicki and Victor Cachat go into the belly of the beast to find out what Manpower is up to, while the villains put the finishing touches on their preparations for Oyster Bay.note This novel runs concurrently with At All Costs and Mission of Honor. Cauldron of Ghosts: Zilwicki and Cachat go after the Mesan Alignment itself — but can even they manage to uproot the ancient conspiracy that has manipulated the galaxy for so long?note Runs from the middle of Mission of Honor (just after Oyster Bay) to the end of Shadow of Freedom. The Talbott Quadrant sub-series, following events in and around the Talbott Quadrant close to the Lynx terminus of the Junction, and the assorted adventures of Michelle Henke, Aivars Terekhov, Augustus Khumalo, Estelle Matsuko, Abigail Hearns, and company. The Shadow of Saganami: What should have been a boring mission for four midshipmen on their snotty cruise turns out to be rather more than they — or their captain — bargained for. Meanwhile, Provisional Governor Estelle Matsuko is pushed to her limit, and Mesa is, as always, up to no good.note This novel runs concurrently with At All Costs. Storm from the Shadows: Michelle Henke heads to the Talbott Quadrant in order to protect Manticore's interests from the Solarian League, but has she bitten off more than she can chew? Not if she has anything to say about it...note This novel runs concurrently with At All Costs and the early chapters of Mission of Honor. Shadow of Freedom: While Manticore and the Grand Alliance try to get a footing in their conflict with the League, Mesa continues to stir up unrest in the Talbott quadrant and its vicinity, trying to involve the Solarians this time.note While this novel started as the second half of A Rising Thunder, thematically (and in the name) it belongs to the Saganami Island subseries. Shadow of Victory: Mesa continues to stir up trouble in the Talbott Quadrant, and even Michelle Henke can only be in so many places at once. Thankfully, recent events in the Manticore system provide her with a bit of extremely valuable assistance.note This novel overlaps with the storyline from Storm From the Shadows through Cauldron of Ghosts, and mostly fills in backstory for events in the Quadrant and the Grand Alliance's response to same. The Young Adult sub-series, focused on Honor Harrington's ancestor Stephanie, the first human to be bonded to a treecat, and her life on Sphinx — set about four hundred years before the main series. A Beautiful Friendship: An expanded version of a short story of the same title, about the first human-treecat bonding, and their attempts to keep the Treecats' intelligence a secret from the more exploitative and xenophobic parts of human society. Fire Season: Climbs Quickly needs the help of Stephanie and her fellow humans in helping a Treecat clan endangered by Sphinx's wildfires. Unfortunately, the telepathic treecats have no way of communicating directly with the mind-blind humans. Also, a scientific expedition has gone missing in the forests of Sphinx, including a young man that Stephanie has found herself infatuated with. Treecat Wars: Stephanie and Karl travel to Manticore for an intensive three month long Forestry Service training program. Meanwhile, a treecat clan displaced by the fires in Fire Season finds itself running afoul of other clans as it tries to find the means to feed and protect their members. Set during the same era as the Stephanie Harrington books, before the discovery of the Manticore Wormhole Junction. A prequel series written by Timothy Zahn, which chronicles the early days of the Royal Manticoran Navy as it begins to explore the galaxy outside the Manticore System. A Call to Duty: Travis Long joins the sleepy Royal Manticoran Navy four hundred years before Honor's time — but the galaxy is a dangerous place, and the RMN may begin to encounter more than it can handle. A Call to Arms: Travis Long, now an officer, faces a battle on two fronts — with the universe outside, and with forces in Manticore's own government which want to strip the Navy bare. Winning one of those battles will be difficult enough; to win both seems impossible. Fortunately, 'impossible' is one word with which Travis Long is not at all acquainted. A Call to Vengeance: What was to be the final book . At least one more planned book. A number of anthologies have been published. Some stories extend on the books, some are stories about individual characters and some are World Building. Multiple authors have contributed to them, most prominently Eric Flint, Timothy Zahn, Jane Lindskold, and John Ringo. "A Beautiful Friendship" by David Weber: The original story of how Stephanie Harrington and Lionheart meet. Later extended into the first book of the Stephanie Harrington books. "A Grand Tour" by David Drake: Not a true Honorverse novel, but more the conceptual antecedent of the RCN books. "A Whiff of Grapeshot" by S.M. Stirling: Tells of the Leveler Uprising which is mentioned in In Enemy Hands and the rise of Esther McQueen. "The Universe of Honor Harrington" by David Weber: An Essay covering diverse topics of the Honorverse as World Building. "The Stray" by Linda Evans: A story about the second human to bond to a treecat, during the same era as the Stephanie Harrington books. "What Price Dreams?" by David Weber: Tells the story of the first time a member of the House of Winton — Crown Princess Adrienne, later Queen Adrienne I of Manticore, monarch of Edward Saganami — bonded to a treecat. "Queen's Gambit" by Jane Lindskold: As King Roger III dies, his daughter Elizabeth has to rise to the throne and learn what it means to be Queen. "The Hard Way Home" by David Weber: Lieutenant Commander Honor Harrington, while evaluating a new type of pinnace, comes across a catastrophic avalanche on a Gryphon Sky Resort. "Deck Load Strike" by Roland J Green: On the planet of Silvestria, the two native nations are at war, with one supported by Manticore and the other by Haven. "Ms. Midshipwoman Harrington" by David Weber: Honor Harrington's snotty cruise into Silesia. What could go wrong? "Nightfall" by David Weber: Originally part of Ashes of Victory and got cut because it would have made the book too long. Describes Oscar Saint-Just's rise to power and Esther McQueen's attempted coup. "From the Highlands" by Eric Flint: Mesa has kidnapped Anton Zilwicki's daughter on Earth, and Havenite spies get involved along the way. Prologue/Backstory for the Crown of Slaves books. "Changer of Worlds" by David Weber: Nimitz and Samantha return to Sphinx to visit and present an idea. "Promised Land" by Jane Lindskold: Crown Prince Michael Winton makes his snotty cruise on a diplomatic mission to Masada — where his future wife is planning her escape. "With One Stone" by Timothy Zahn: Someone is attacking ships in Silesia, and Admiral Sonja Hemphill fears that they are using a weapon more powerful than her Grav Lance to do it. Lieutenant Rafael Cardones of HMS Fearless gets sent to find out more. "A Ship Named Francis" by John Ringo and Victor Mitchell: The story of the strangest ship in the Grayson Navy. "Let's Go To Prague" by John Ringo: Two Manticoran spies take a vacation. On a Havenite world. What could possibly go wrong? "Fanatic" by Eric Flint: A People's Commissioner is found dead and Oscar Saint-Just sends his best man to figure out who did it: Victor Cachat. Another Prequel for Crown of Slaves. "The Service of the Sword" by David Weber: Ms Midshipwoman Abigail Hearns, the first native female officer of the Grayson Space Navy, makes her snotty cruise on board the HMS Gauntlet — under the command of Captain Michael Oversteegen. "Ruthless" by Jane Lindskold: Sequel to "Promised Land", detailing Michael Winton and Judith Templeton on Manticore. "An Act of War" by Timothy Zahn: Haven attempts a False Flag Operation to draw in the Andermani into the war against Manticore. Mysterious arms dealer Charles from "With One Stone" gets volunteered by a still resentful Oscar Saint-Just to make it happen. "Let's Dance" by David Weber: Commander Honor Harrington, CO of HMS Hawkwing, is on a anti-piracy mission in Silesia as the Audobon Ballroom asks her for a dance. "An Introduction to Modern Starship Armor Design" by Hegel DiLutorio: A Tech Bible, describing Starship Armor and Weaponry. "By The Book" by Charles E Gannon: Tells the story of Earth during the early diaspora, as Luddites and extreme Greens are the Government. "A Call To Arms" by Timothy Zahn: Lieutenant Travis Uriah Long is an Officer in the still young Royal Manticoran Navy as a Solarian Transstellar decides to acquire the Star Kingdom. The prequel to the Manticore Ascendant sub-series, co-written by Zahn, Webber, and Thomas Pope. "Beauty and the Beast" by David Weber: Lieutenant Alfred Harrington arrives on Beowulf for his medical education... and meets a young woman named Allison Chou. "The Best Laid Plans" by David Weber: Young Honor Harrington just wants to make a quick trip into the Sphinxian woods — just as a treecat named Laughs Brightly makes his rounds on his clan's range. "Obligated Service" by Joelle Presby: Extending the Grayson Navy Letters Home, it follows Ensign Claire Bedlam Lecroix, one of the first female officers in the GSN. House of Steel gives detailed information both the Star Kingdom/Empire of Manticore and the Protectorate of Grayson and contains the novella I Will Build My House of Steel, which follows Roger Winton, Roger III of Manticore, as he prepared his Kingdom for the inevitable war with the People's Republic of Haven. House of Lies (due TBA, working title) will contain similar information about Haven, the Andermani and (possibly) Silesia. Also included will be a novella, tentatively intended to focus on the implementation of the DuQuesne plan and the rise of the Legislaturalists. House of Shadows (due TBA, working title) will center upon Mesa, the Solarian League and (if it doesn't fit into the second companion) Silesia. The Novella will tell about the beginnings of the Mesan Alignment. "Our Sacred Honor" by David Weber: A look at Eloise Pritchart's early life and the event that spurred her to become a revolutionary and join the April Tribunal. Published in the non-Baen science fiction anthology Infinite Stars . "Grayson Navy Letters Home " by Joelle Presby: The correspondence between Ensign Cecelie Rustin and her Family as she is on deployment in the GSN. Covers the same territory as "Obligated Service", from another perspective. "Dark Fall " by David Weber: A short story about the star system codenamed "Bolthole", the people who live there, and how Acting President Eloise Pritchart and the planet's leader negotiated its transition between the People's Republic and the soon-to-be-resurrected Republic of Haven. A computer game based on the Honorverse called "Tales of Honor: The Secret Fleet" for iPad and tablet. All the novels up to A Beautiful Friendship are legally available for free, along with many other Baen Books titles, via the Baen Free CD site . The best collection of Honorverse titles is on the Mission of Honor promotional CD that was included with the hardback. A tie-in graphic novel series called "Tales of Honor", covering the events of On Basilisk Station did get released, along with a game for mobile devices. Warning: Spoilers ahead. As a Long Runner, Late Arrival Spoilers of the early books are unavoidable. Caution advised.